If you want to add a navigation menu, with hovering effect and drop down menu capability in blogger blog to give it a more website like feel, this is how you do it. The menu we are going to add looks like the one in my home page. Now you save the widget and save the template. Your new web template with drop down menu is ready !! If you find any bugs in this do let me know. I have tested it in my own website and it looks perfectly OK ..
bạn ơi cho mình hỏi. có bảng menu nào y như vậy. mà dùng cho blogspot được không. 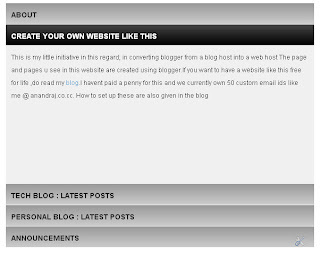 I embedded the code into the blogspot and do so that it does not show. How you can help me. vertical accordian menu. looked good. thank you in advance dental.